In MY DEAR, be enchanted by the fairytale like paintings immortalizing childhood innocence. Remove your judgements about what is possible and not; bring your mind back to the time you were five years old, looking at a picture which does not seem like reality, whilst not knowing it doesn’t exist. Meng Yan combines a child’s naivety and purity with traditional Chinese elements of wide lotus leaves, flourishing peonies, and majestic phoenixes. These trademarks of a typical Chinese New Year illustration reminds us of how good fortune and prosperity is depicted in the Chinese culture. Perhaps, the pairing of innocence and wealth symbolizes the precious moments of childhood, that it is to be cherished and not taken for granted of. 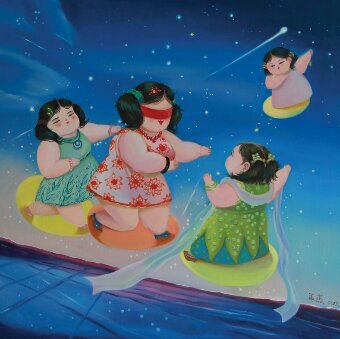 Vibrant colours, chubby children, carefree expressions and dream like backgrounds captures happiness and vigour into Meng Yan’s paintings, and also demonstrates her pursuit of purity, optimism, liveliness and freedom. Born in Shandong in 1982, Meng Yan obtained both undergraduate and master degrees in Oil Painting Department of Sichuan Fine Arts Institute. After completing her graduate school study in 2010, Meng Yan decided to return to her birthplace to further pursue her artistic career. 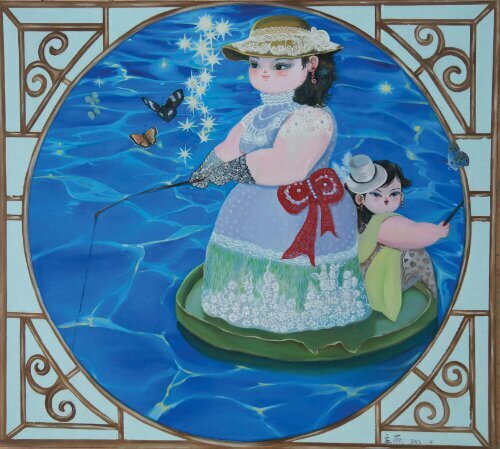 She is one of the up-and-coming contemporary artists from China, and her works are visually stunning and vibrant. 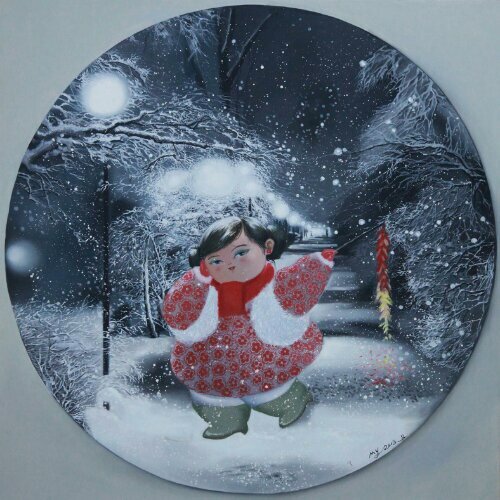 By presenting a sense of harmoniousness, Meng Yan paints an indelible mark on people’s hearts. Posted on November 15, 2013 by ChalkandRaddyPosted in Visual ArtTagged art gallery hong kong, ecgallery, Meng Yan.